THE Scotsman says we should “insist on clarity” regarding the conditions of a second Scottish independence referendum (Comment, 17 February), but that clarity depends on scrutinising the terms of the debate. In this respect, claiming that an exit from the European Union could “trigger” a Scottish referendum is unhelpful. Exiting the EU would trigger discontent in Scotland, perhaps even widely, but it will not trigger a referendum. Like the first Scottish referendum, a second will require the legal agreement of the Scottish and UK governments. 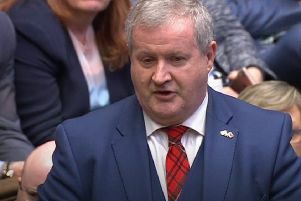 Only a second version of the Edinburgh Agreement of 2012 could in fact trigger a second Scottish referendum, and for the foreseeable future, current Prime Minister David Cameron has ruled that out. With Angela Merkel accepting that there is a real need for reform of the European Union, it looks as though Prime Minister David Cameron is going to deliver a substantive package of changes. For him it will be a personal success, achieved against the odds, but still of course needing the all-important positive result in the subsequent referendum. Yet how will it be received in Scotland, where many prefer to demonise the Tory party rather than consider if anything good could come from them? In particular, will the SNP, which professes to being pro-Europe, be able to properly get behind promoting the case for Europe or will the SNP continue to primarily view it as just another platform for Nationalist posturing? (“Sturgeon says Brexit could trigger IndyRef2”, your report, 17 February). I assume I am not alone in being subject to the dreadful inadequacies of the capital’s “International” Airport? It really is a very poor introduction to Edinburgh when on arrival at times taxis are simply not there. Why? The evidence presented itself to me on Wednesday evening arriving back into Edinburgh from Manchester. I had pre-booked a taxi to pick me up. My pre-booked taxi was timed perfectly, met me at the pick-up point and we departed only to stop a moment or two later as the driver had to sort out his “ticket”. It transpires that the pre-booked taxi had to pay £3.90 to depart the airport and this clearly cannot be added to the fare. Frankly, this is disgraceful and the driver also advised me that the drop-off charge of £1 is increasing to £2 very shortly. This is nothing short of daylight robbery. To compound the inadequacies, the “planners” at the airport have a pedestrian crossing situated as cars arrive at the drop-off zone and again, I have no doubt other readers will have suffered the interminable delays in actually accessing the drop-off zone as departing and arriving passengers flow across the pedestrian crossing. The whole experience feels amateurish and money grabbing and it will not be long unsurprisingly until taxi drivers desert the airport and its customers all together. A major rethink is required urgently. There is to be a political party leaders ‘ debate in the run-up to the Holyrood elections. It is to be on the 29 March in the Assembly Rooms in Edinburgh and will be televised by STV. Sadly, it is to be in front of a live audience. We can expect the usual grandstanding by the participants playing to their supporters, scoring cheap political points to no purpose other than to whip up the audience. One just has to cast one’s mind back to the referendum debates to remember the disgraceful audience behaviour. It just needs someone to complain about Thatcher, bankers and Westminster as well as “refusing to take any lectures from Tory toffs” to set off a baying mob. The advent of televising Westminster and Holyrood has created the most unedifying state of affairs with nodding donkeys on all sides positioning themselves so that they get the greatest TV exposure. The SNP proposals for more BBC Scottish TV content and SNP oversight fill me with horror (your report, 18 February). If I thought the additional resources would enable proper reporting and broadcasting, I’d be all for it. But I am sure it is nothing more than a sinister plan to neuter the biggest, most trusted, media organisation in my country. It was reassuring to read of the Scottish Government’s decision to put an additional £23 million towards increasing the number of medical graduates in Scotland by 50. But is this enough? There is an increasing trend for both male and female graduates to work part-time which has led to difficulties recruiting principals in general practice. Therefore, the number of medical graduates in Scotland requires to be many more than 50. The other problem is the retention of medical graduates in this country. I had a medical cadetship from the Royal Navy for part of my undergraduate training and was contracted to spend the first five years of my medical career in the Royal Navy. If I left for any reason before the five years was completed I would have been required to pay back all the monies I had received in training. I should like to suggest that a similar system is put in place for future medical graduates. The energy policy of the Scottish Greens and the SNP government might not be as daft as you suggest (Letters, 18 February). Just a bit ahead of its time. In England, the government is financing several energy storage projects, one an £8 million demonstration plant at Pilsworth near Manchester using liquefied air, and a lithium ion battery project by the Moixa group. UKPN is installing a battery plant in Leighton Buzzard, UK’s largest so far, and in Northern Ireland a 10 megawatt Lithium ion plant is being installed at Kilroot power station. Even in Scotland there is a flow battery project on the Isle of Gigha. But Wales is leading with the very recent installation of the latest in household batteries. These are neat wall mounted units which store a day’s requirement of electricity. They are becoming popular in the southern US as they enable households to go “off-grid” using solar energy generated during the day. Our nuclear future is bound up with the future of Hinkley Point C. Delays there were largely responsible for EDF deciding to extend the life of Torness. Some have doubts as to its completion. It is unlikely that there will be another one, especially in Scotland. If Scotland is to play any part in energy supply we had better settle for wind turbines and storage systems. It was pleasing to read that EDF has invested time and effort to increase the operational life of Torness Power Station which gives another seven years of reliable low-carbon energy. It is a fact that Hunterston and Torness have provided the bulk of Scottish electricity over the last quarter of a century. The reactors can achieve an annual capacity of near 95 per cent, which is better than 27 per cent for wind. It was interesting to read the comment from Sarah Beattie-Smith, for the Scottish greens “With Scotland’s abundant renewable energy resources and the need to focus on energy-efficiency, we have no need for nuclear”. She clearly forgets last month, 19 January, the coldest day of the winter so far. At 5:30pm, the evening peak demand, all the UK wind turbines metered by the National Grid generated 70mW of electricity. The UK demand that evening was 51,920mW. The registered wind capacity with operational metering in the UK is 8,972mW at present. 70mW is 0.78 per cent of the possible wind figure and 0.13 per cent of the demand figure that evening. The registered nuclear capacity with operational metering in the UK is 9,140mW at present. Throughout 19 January, nuclear generated 7,800mW which is 85 per cent of the possible nuclear figure and 15 per cent of the demand figure that evening. From a Scottish point of view, extending the life of Torness, generating reliable low-carbon electricity helps the Scottish Government focus on climate change targets. Lady Wise may well believe her four-year sentence (albeit with lifelong supervision thereafter) on a 26-year-old serial thug, is “a very significant punishment” (your report, 18 February). His 15-year-old Dunfermline victim and her parents, and the rest of us (especially those with grandchildren approaching her age) may well disagree, regarding it as yet another example of our judicial system’s and our politicians’ leniency to perpetrators of terrible crimes. His appalling record should have ensured he was still in jail, unable to commit this latest atrocity. As a regular commuter between Edinburgh and Glasgow, long used to shelling out exorbitant amounts for day tickets to the Dutch-state owned Abellio, I have to say the tendency for their ScotRail franchise to cancel services at the drop of a hat, with no concern for travellers’ journey times, suggests that, when it comes to inconvenience, Abellio are not going Dutch.